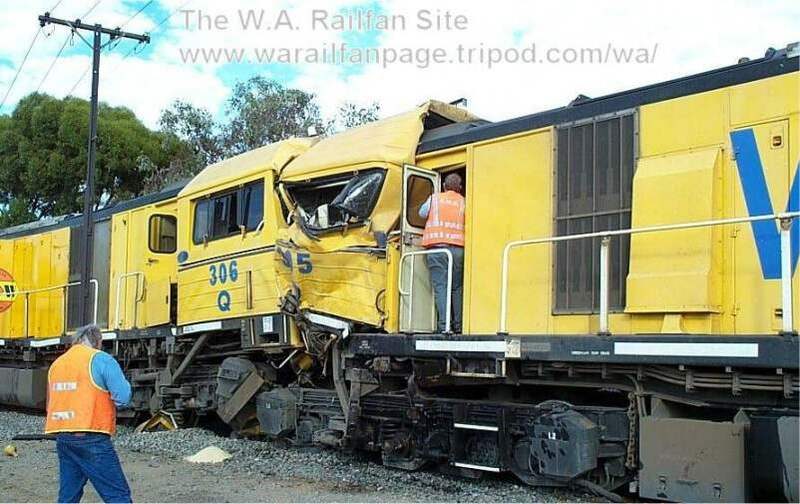 AWR has suffered it's worst mishap since it took over the former Westrail Freight Business. Late on Monday 11 February 2002, Q306/L255 were working light engine back into West Kalgoorlie Depot after stabling the train from Malcolm. While traversing the 1km or so to the depot, a malfunction is said to have occured with the computer on Q306 and affected the braking of the locomotive. With the points set for the depot and the crew trying in vain to slow the locomotives while sounding the horn it became evident to the crew that an impact was going to occur and bailed out of Q306. Rumoured to be travelling at 65kmh, Q306/L255 struck a line of stabled locos Q305/256/Q309/L260. As can be seen from the photo Q305 looks the worst damaged but Q305 has a badly bent frame and will cost alot more to repair. The 2 Q's will most probably be towed to EDI Port Augusta for inspection and possible repair, while L255/Q305/Q309/L260 are being towed to EDI Forrestfield for repair. Sadly a Skilled Engineering driver, in the cab of Q305 was slightly injured in the accident.